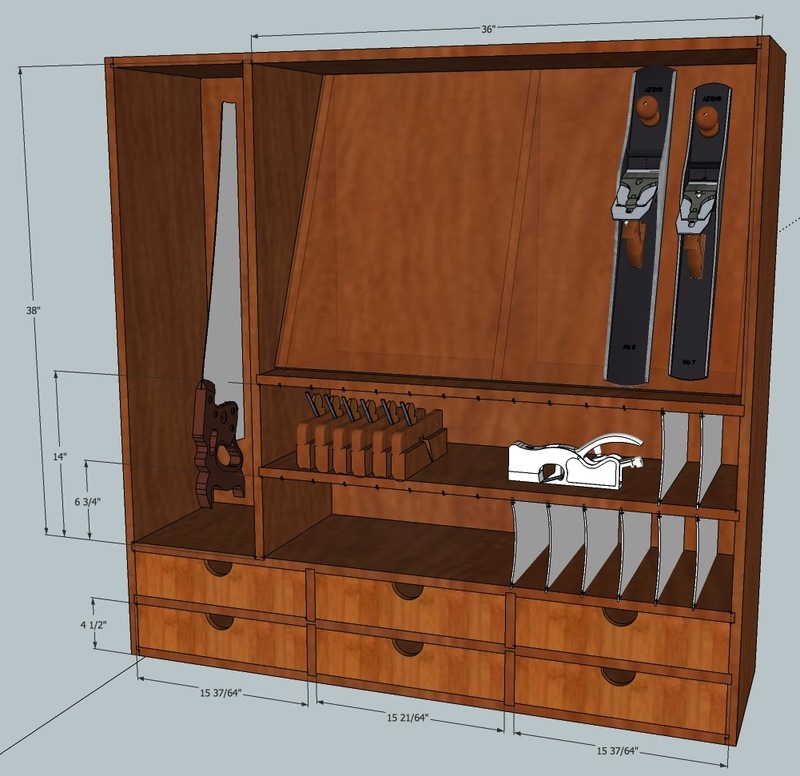 I slightly updated my tool cabinet design. I needed the measurements for the dados for the rest of the internal dividers so I can cut the rest of the parts to size and plow the dados. Once this is done (and after I buy another sheet of 1/2″ ply to re-make the back panel) I should be able to assemble the main case. I added cubby dividers, which will be a loose fit so they can be repositioned as necessary. I settled on 2.5″ spacing on those after measuring my tools. All of my joinery planes will fit in either a 2.5″ space or a 5″ space. I may end up making s small horizontal sub-divider to fit two block planes in one slot. I’m only using these between the joinery planes, not the moulding planes, to keep them from knocking into each other and to keep them from getting tangled together. The cubby dividers will be 1/8″ MDF or Masonite. Next time I sit down with Sketchup I’ll start figuring out the doors in more detail, and probably add in the drawer details too. If you want to get the current Sketchup model you can download it here. I might have missed this – but have you thought of hinging the plane storage boards so you can acces the dead space behing them? CHB did this on the Lie Nielsen toolbox he made. No, I thought about doing that, but with 40 pounds of planes on the ramp I didn’t think it would very practical. I’ll have more drawer space than I know what to do with already. Suggest 1/8″ baltic birch for the dividers. Looks WAY better than mdf or masonite.